$4,950.00 Order of the Red Banner of Russian Federation, Type 1, #12702, circa early to mid-1920s. In very fine condition, absolutely extraordinary for the Soviet combat award of its vintage. The enamel is original, with no repairs and only minimal wear. The extended portions of the flagpole and torch are completely intact. Includes original serial numbered screw plate. This is one of the best examples of this decoration we have ever handled. $9,950.00 Large certificate for Honorary Revolutionary Weapon,	a sword with the Order of the Red Banner of RSFSR inserted in the handle. One of only 21 Revolutionary Honor Edged Weapons ever issued. $750.00 Large certificate for Order of the Red Banner of RSFSR, issued on 4 November 1924 to Commander of the 172nd Rifle Regiment. Archivally mounted on linen and handsomely framed. $1,850.00 Order of the Red Banner, Type 1, Var. 2, Sub- var. 3 ("Mirror Reverse"), #13389, awarded in May 1940 to a reconnaissance officer for the storming of the Mannerheim Line during the Winter War against Finland. The recipient served with distinction throughout the rest of WW2 earning an Order of the Red Star at Stalingrad and two Orders of the Patriotic War 2nd cl., one for the crossing of the Dnieper in 1943 and another for the attack against Japan in 1945. The order is in good overall condition, with the usual enamel losses but never converted to suspension - very respectable for a Type 1 "Mirror Back" Red Banner. Includes original screw plate. Comes with comprehensive archival research. $995.00 Order of the Red Banner, Type 2, Var. 3, Sub-var. 1, #46539, awarded to a reconnaissance scout platoon commander for ambushing a Finnish recon detachment in no man's land in Karelia in April 1944. He personally killed 3 enemy scouts in the skirmish that resulted in total annihilation of the enemy group. The award is a very interesting late issue screw back that was customized to wear on suspension without completely removing the screw post. The obverse is in fine condition, free of enamel repairs. Comes with comprehensive archival research. $340.00 Order of the Red Banner, Type 4, Var. 1, #183249, November 1944 length of service issue to a Red Army Colonel. The order is in outstanding condition - practically impossible to upgrade for a WW2 Red Banner. Comes with archival research and partial English translation. $260.00 Order of the Red Banner, Type 4, Var. 2, Sub-var. 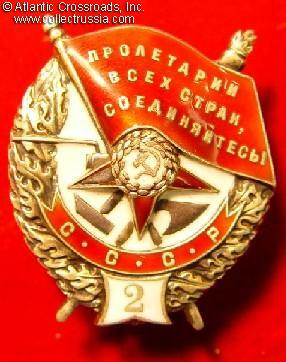 2, #200678, awarded in November 1944 to a military commandant of one of the stations of a major railway line connecting Moscow area with the Kursk and Stalingrad regions. Although the award was issued for length of service, we can assume that the recipient served with distinction during the Battles of Stalingrad and Kursk, when this railroad played a vital role in carrying supplies and reinforcement to the combat zones. The order is in very fine condition. Comes with partial archival research. $320.00 Order of the Red Banner, #331567, circa 1949 issue. Type 4, Var. 1 according to Strekalov classification (McDaniel Type 3), this is a WW2 version featuring relatively rounded overall shape and mint mark in single line. A very interesting piece with a serial number near the upper limit for the Type 4. In excellent condition and includes original suspension. $240.00 Order of the Red Banner, Type 5 Variation 1 ("Valik"), #336401, circa 1950. A distinctive and relatively scarce version. In excellent condition. $200.00 Order of the Red Banner Type 5, Var. 2, Sub-var. 2, #383321, circa 1952-53 issue. One of the less common post-war versions made by the Moscow Mint. In excellent condition. $2,250.00 Order of the Red Banner 3rd award, Type 5, Var. 1, Sub-var. 2 (Durov & Strekalov classification), #7165, circa early 1950s. This is a very scarce version of the 3rd Red Banner: only 500 specimens were ever produced. Excellent example. $45.00 "The Order of the Red Banner" Durov, Strekalov, C. 2006, Moscow, Russian text. This landmark reference is a required reading for the serious collector of Soviet awards and is unlikely to be surpassed.